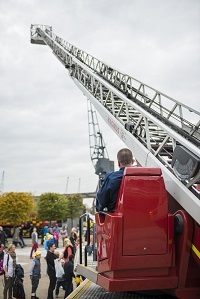 Firefighters will turn heads on Saturday when they take to the streets of Portsmouth in full breathing apparatus carrying a giant ladder. The crews will march the 10.5-metre piece of gear a grueling 13 miles from Horndean Fire Station to Gun Wharf Quays starting at 10am. The team of up to 30 ladder-laden firefighters will raise money for The Firefighters Charity and Football For Cancer (FFC) with bucket collections on the day. Organiser and watch manager Craig Sadler said: “If people want to turn out and give us a cheer or a wave that would be great. “Obviously we are looking to raise money for two good causes but it is also nice for people to see us doing things and being at the heart of the local community”. He added the teams from Cosham, Waterlooville and Hordean were giving up their own time to raise funds for the worthy causes. The ladder will be carried by six people who will rotate with others who will have buckets to collect donations. There will be engines along the route where people will get the chance to have photos taken behind the wheel or get safety advice. The group aim to reach the harbour entrance at about 4.30pm.